Fat Quarterly Shape Workshop for Quilters, a photo by jenib320 on Flickr. Hello Everyone! 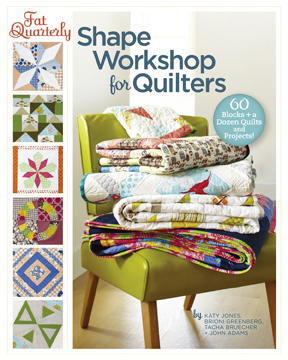 Welcome to my stop on the Fat Quarterly Shape Workshop for Quilters Blog Tour! If you aren't familiar with Fat Quarterly, it's a popular e-magazine for modern sewists! The e-zine and now this new book are put out by the talented Katy Jones, Brioni Greenberg, Tacha Bruecher, and John Q. Adams. Lynne Goldsworthy has also recently joined the FQ team! Now, on to the book! Flat out, I love this book. In my mind, most quilting books can be put into two categories: books with quilt blocks, and books with quilt patterns. Lucky for us, this book has both! The book is divided into six sections, each focusing on a different shape: squares & rectangles, circles, triangles, stars, polygons, and diamonds. I combed through the book and narrowed down my favorite project from each author! Let's take a look! John Q. Adams - Cub Crawl Baby Quilt - I am always on the lookout for quilts that have large blocks or leave large sections of fabric intact. Perfect for showcasing those extra special prints! Katy Jones - Orange Soda Quilt - I generally shy away from applique, but this quilt has me wanting to give it a try! The patchwork is so fun, it's just such a cheerful quilt! Tacha Bruecher - Fast Forward/Rewind Quilt - Who can resist a good flying geese quilt? I sure can't! The different sized geese in this quilt did me in right away! Brioni Greenberg - Starry Hanging Storage - I'll be making room for one of these for sure! So much patchworky goodness, I love the star piecework especially! There is a little something for everyone in this book, whether you're a seasoned quilter or you're just beginning. I think this is a must-have book for any modern quilter! You can find the book for sale here! I encourage you to check out the Fat Quarterly blog and e-zine issues as well! Lark Crafts has kindly offered up a copy of the book for one lucky reader! To enter, just leave a comment! One entry per person, I'll choose a winner randomly. Giveaway ends Friday, June 1st at 5pm CST. Giveaway is now closed, thanks! Don't forget to check out the rest of the tour! 5/18 Kickoff at FatQuarterly.com and LarkCrafts.com! 7/18 Wrap-up Party at FatQuarterly.com! This one is on my 'must have' list! So even if I don't win, I'll be buying one, sometime anyway! I need this book. Will get it one way or another! This book looks so yummy! This book is definitely an interesting one! Thanks for the review! I'd love to have a closer look to this book! thanks for the chance! Oh my gosh, that flying geese quilt is awesome!! Looks like a fab book, thanks for the recommendation and the chance to win a copy! I love this book, there seems to lots of great projects! I would love to have this book, it looks fantastic :) Thanks for the chance to win! I live a good quilting book and this one looks great! I have been hankering after this book. It looks fabulous. I'm with you - I too love patterns that allow you to showcase the fabric. Looks like a great book. Thanks for the chance to win. Oh please enter me into the draw for this book!! I would love to win this fabulous book!! Thank you very much for the chance. You have convinced me that I absolutely must have this book. Thanks for the chance to win it. It looks like a great book , thanks for the chance to win. I love that flying geese quilt! Hoping this is an international giveaway ... this book looks fab! This book looks amazing! Can't wait to see it in person! Wow...I'd love to win a copy of this book...looks really good. Thanks for a great giveaway! Would love the chance for a little inspiration! It looks like a great book. What a great book! Thanks for the giveaway! I'm a novice quilter and this book would be invaluable for me. This really looks like an interesting book:) I'm still new to quilting, really like it, but there is just not enough time for it. Sounds like a great book!!!! Thanks for the chance to win! This book looks fabulous-I'd love to win! Thanks for the chance! Oh awesome! Thanks for the opportunity. I am looking for a "complicated looking" pattern for a quilt for my husband. I like simple and he likes visually complicated so maybe this book will have a nice balance for a new idea. Thanks! That book looks great. Thanks for the opportunity to win!!! Love the cub crawl baby quilt and fast forward rewind. Thanks for the chance to win. Ooh, I have had my eye on this for a while. Thanks for the chance to win a copy. I love the ones you featured. Would be beautiful fun projects. Wow. That looks like one great book that ever quilter needs to have. Thanks for the sneek peak. Wow! Would love to make that cub crawl baby quilt! Mthanks for the chance! That starry wall hanging looks great! Thanks. thank you for highlighting your faves in this book--it makes me want it all the more! Great giveaway! I love making quilts with geometric designs. Please enter me in the giveaway. Thanks! I am tempted to add this to my library! Would love to win! It looks like a brilliant book. The book looks like it's overflowing with inspiration! Thanks for the chance to win it! Looks like a great book! Thanks for the peek! Thanks for the peek inside the book - loads of talent showcased there for sure! I want one!! Yet another book to add to my (very long) list of "must have" books. Thanks for a chance to win a copy. Ohhhh! I'd love a new quilt book. This is on my amazon wishlist! It looks such a great book! I sure am in need of a new & fresh quilt book! This one looks fabulous!!!! Great review of this book! I love that star organizer also. That looks so cool! Thanks for the chance! Give away TREAT would love to win this little baby. I want this book! I'm going to go put it on my wish list in case I don't win it! What a great book! I would love to win! Looks like there are some great projects in that book! I love that baby quilt too! Perfect for large, cute prints! Love the looks of this book! Would love to learn that circle block and flying geese! Pick me! :) Thanks for the giveaway. That book looks like a lot of fun! I'm going to have to keep an eye out for it. I also love the orange soda quilt! That does look like a fantastic book! Thanks so much for sharing. looks awesome! thanks for the chance to win! looks like a great book! love that flying geese quilt. This book looks awesome! Thanks for the chance to win! This looks like such a great book - always looking for new inspiration. Thank you for the giveaway! Good Morning Tuesday! Looks like fun. I enjoy most everything those authors do. The flying geese quilt got me too! What a great book. That book looks great! Thanks for the giveaway! I've been excited about this book ever since it was announced, but still haven't managed to order it! Thanks for the chance to win a copy! I would love to win the book. Thanks for the giveaway and thanks for providing us with the pleasure of reading your blog. Love the orange soda quilt! Looks like an awesome book! This book looks like a great resource- I'd really love to win it! Would love it! Thanks for the chance. Looks like a fun book! Thanks for the giveaway! Wow. Looks like a wonderful book. Thanks for sharing. Would love to own this book! tks fr the chance! Great review and wonderful giveaway! thanks for the chance! Thanks for the chance to win this book. I'm hoping to participate in the quilt-along with it starting June 10. Oh this book looks amazing! Thanks for the chance to win! Another awesome review of the book... It makes me want the book even more now :-) Fingers crossed! This book looks awesome- I tend to approach quilts from a block first point of view and then figure out the layout- looks there would be some great starters here. Well, after that review I can't help but feel that I *need* this book! Thank you for the chance to win it! Oh my goodness I just love what you have shown of the book! How I would LOVE to win it. Crossing my fingers!!! Thanks for the opportunity. Great book. Thanks for the chance to win it. this looks like a fantastic book, I would love to recieve it! This looks like a really good book. Lots of neat ideas. This looks like such a great book! Can't wait to get my hands on this book! The book looks great! Thanks for the peek inside! I'd love to win a copy - thanks for the chance. Great projects in there! Hope I win!! I also love the fast forward rewind quilt. A fresh take on flying geese! The book looks great. Thanks for the giveaway! This book really looks great. I love the Flying Geese "Fast Forward/Rewind" quilt alot myself. This book looks awesome and I think you are right it is another must have for me. Thanks for the chance to win a copy. This is on my wish-list so I would love to snag a copy. I really like the scrappy circle pattern. Looks like a fun book! Thanks for a chance to win it! I love this book, I have been wanting to buy it. I love all the patterns that I have seen in it. Thanks for the chance to win. I've been wanting to get my hands on a copy of this! As a beginner quilter I would love this as a resource. Thank you for the giveaway. Neat book. Would love to add to the collection! The book looks great! Thanks for a chance to win it. Good luck, everyone! Thanks for showing us your favorites. They all look great, and I'm sure the others do as well. This book looks awesome!!! Thanks for the chance! Love your fabrics. Beautiful colors. I nedto get my needle and thread out and get moving! I would like to have this book. It look very interesting and usefull! Thank you for chance to win! Wow, looks like a great variety of blocks! Thanks for the review,Putting on my wish list. I completely agree about how quilt books divide into those two categories. It's absolutely wonderful to hear that this book has both. Thanks for the very informative review. this book looks like it could teach me a thing or too! I am just starting to quilt and this book would be great! Thanks for the giveaway. Thanks for the peek! Looks like a book I'd love to own! I've been desperately trying to win a copy of this book. I've won a book from you before, maybe I'll get lucky and win another! Thanks for the giveaway Jeni! Count me in! Dang, so many great modern quilt books out now... my wish list is long! Hi, i would love to win the book. It looks great. This book looks brilliant! I love the three quilts and the hanging storage is really cool! This is definitely going on my wish list! Love this! So many new projects I could get started on! Thanks for the chance to win! I must have this book. Pick me...pretty please! Fantastic book...can't wait to read it!! oh, i love that orange soda quilt! this book is on my 'must have' list :) tahnks for the giveaway! I love all the pictures I have seen in this book. I think the book would be a great addition to anyone's quilt library. That looks like a neat book, thanks for the chance to win it. I saw this book on Quilt Dad's blog and loved it! Thanks for sharing more of the pictures. If I won I would give it to my mom for her birthday. I know she'd love it. Thanks!! New quilter here- I really need this book!! Would love to add this book to my collection. this e zine is also great. The book looks amazing, would love some new ideas! Thank you! wow, lots of great ideas in that book! What a cool book! Thanks for the chance to win! I love that Flying Geese as well -- here's hoping! I would love to win this wonderful book! Thanks! Thanks for the chance to win this wonderful book! Oh, this looks like a fun book!! I'm pretty new to quilting, but I think I could have loads of fun with this! I just downloaded my first issues of Fat Quarterly, and I would LOVE to win this book. Thanks! Ooh, I'd love to win this book. Thanks so much for the giveaway! Looks like a great book. I too like the flying geese quilt. Thanks for the review and giveaway. Oooooo... The colors are making me drool! I would love a new book to add to my collection. Looks like a good one! This is a great book! I love all the variety of ideas. this book looks so great!! this looks like a great book for me! love circles, and flying geese! This looks like such a great book that will inspire and provide great projects! I would love to add this to my library! Thank you for the giveaway oppotunity!